Two well-known honchos have used the current turmoil in stock markets to buy shares in their own companies. 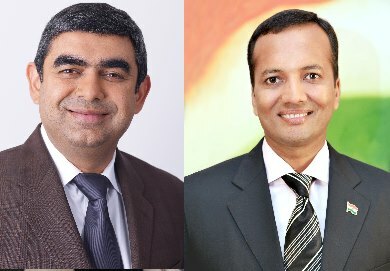 Infosys CEO and managing director Vishal Sikka bought 9,116 shares in the company, the IT outsourcer said in a statement on Wednesday. Dr Sikka partly exercised the 22,794 restricted stock units awarded to him last year. These units were granted at a price of Rs 5 a share, with a vesting period of four years, subject to performance. Jindal Steel and Power promoter Naveen Jindal bought 25 lakh shares in his company on August 25. Mr Jindal bought these shares on a day, when Jindal Steel and Power shares hit a new 52-week low of Rs 60.75, according to Bombay Stock Exchange data. When promoters or key management personnel (e.g. CEO, managing director, etc.) buy shares in their own company, a positive message goes out to investors, analysts say. The move signals that promoters or people entrusted with running the operations of the company are confident about the business prospects. Hits: 787, Rating : ( 5 ) by 1 User(s).